Better late than never…right? I’ve been sick as a dog but loved the challenge colours over at the Colour Me…! challenge blog this week and couldn’t wait to play along. The CMCC#48 is to create a project with two shades of purple (plum, and aubergine), a pink, and a teal. Love it, right?! 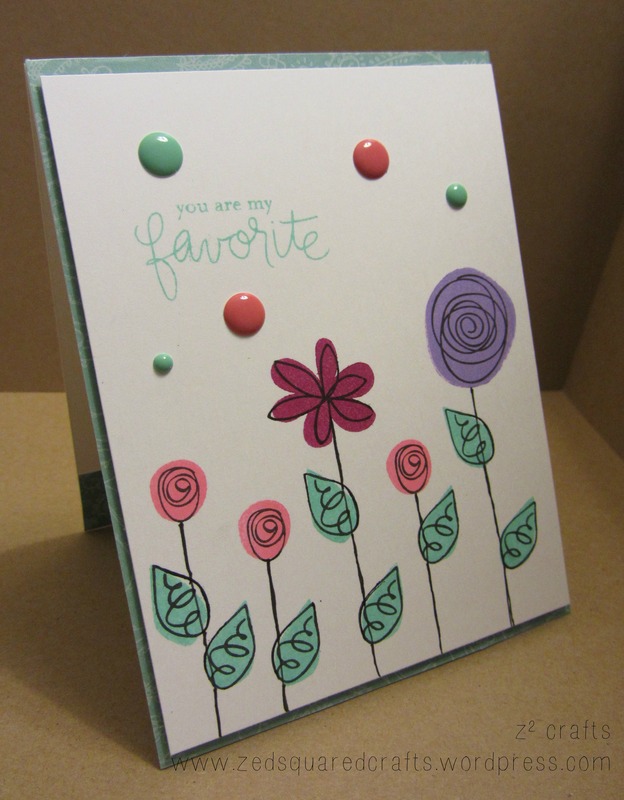 The stamp set (Favorite Flowers), and the enamel embellishments (My Mind’s Eye, Now & Then), were both from my Simon Says Stamp June card kit. I stamped the flowers and leaves using pigment inks from my Color Box Petal Point (Enchantment set) and then used VersaFine Onyx Black for the flower and leaf detail. I used a thin black marker to draw the stems to keep with the stamp set’s sketchy feel. I adhered a scrap of teal patterned paper to my A2 cardbase and then popped up the front panel with some foam tape. That’s it for today! Thank you so much for dropping by. Don’t forget to stop by again soon to catch up on my Twelve days of Christmas series. Have a great week!